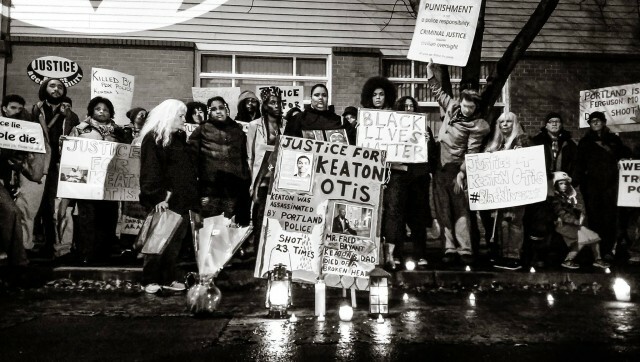 On May 12, 2010, Keaton Otis, a Black man, was killed by the Portland police. Since that date there has been vigil in his honor and memory on the 12th of each month near the southwest corner of NE 6th and Halsey, just feet from the site of his murder. The vigils, begun by Otis’ late father, Fred Bryant, have been continued by Bryant’s daughter, Alyssa, as well as Jo Ann Hardesty and Walidah Imarisha, two longtime activists who were friends with Bryant. Portland police have a long history of shooting people, particularly people of color, and not being held accountable for their actions. In June 2011, the Department of Justice (DoJ) announced it would be investigating the Portland Police Bureau (PPB) for its overzealous use of force against people with and perceived to have mental health disabilities. Originally, the DoJ had been asked to investigate the PPB’s poor relationship with and its proclivity for using violence against communities of color, particularly the Black community. While sidestepping that request, the final report did touch upon the issue. Police violence comes at what Imarisha, echoing Angela Davis, calls “the intersections of intimate and social violence.” Police are not killing unarmed Black people because the thought occurs to them out of the blue. Behind these murders lie all sorts of institutional forms of violence. Likewise, poverty and gentrification do not form from thin air. They are the result of laws, regulations, contracts, red lines, predatory loans, and other systemic oppression made in the name of a society hiding behind a cloak of equality, freedom, and the American dream. They are the by-products and enforcement tools of white supremacy. Francis, who knew Otis from the time her 4-year-old son and Otis played t-ball together described him as “a fine, fine, fine young man”, who was both a good artist and a good friend to her son. Francis referred to Otis’ death as an execution. It is not a word to use lightly, but if one views the footage of Otis’ stop and the police subsequently shooting him–particularly when Otis says, “My hands are up,” and one cop, just before the bullets fly, says, “Let’s do this”–there is no other word for it. Otis’ death was hardly unique, whether looked at from a local or national perspective. But his father’s stubborn refusal to sit down and shut up about it made it just a little harder to ignore the calls for justice. The DoJ settlement with the City has at best taken small steps toward solving these problems, but Imarisha expressed her doubts. 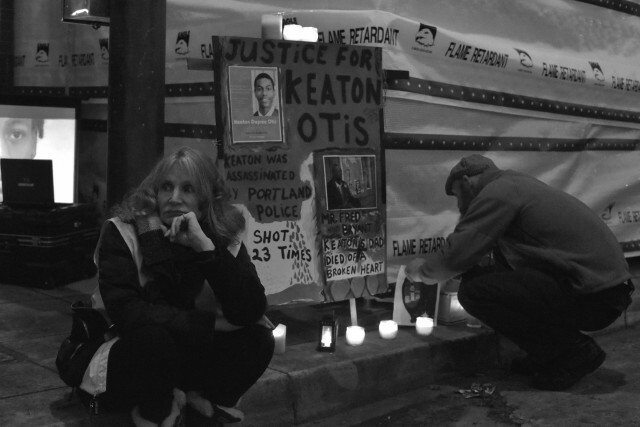 “Keaton Otis was not stopped for having mental health problems,” she said. “He was stopped for being a young Black man. This is not going to be solved by another 4 hour training the police can check off or another panel with no power.” The panel to which Imarisha referred was the new Community Oversight Advisory Board (COAB). 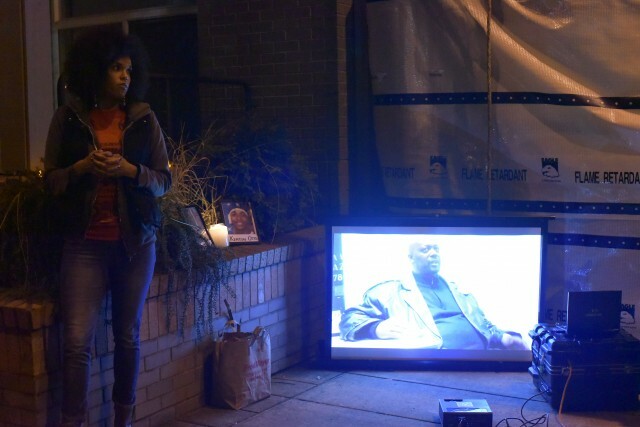 Some of the vigil attendees, however, disagreed with Imarisha. One woman, a member of the COAB, urged people to get involved with board members and their meetings. Another woman later also registered support for the oversight board. According to a City of Portland webpage of frequently asked questions about the COAB, the board is authorized to “independently assess the implementation of the Agreement; make recommendations to the Portland Police, DOJ and the Community Officer and Community Liaison on additional actions; advise the Chief of Police and Police Commissioner on strategies to improve community relations; provide the community with information on the Agreement and implementation; contribute to the development and implementation of a PPB Community Engagement and Outreach Plan (CEO Plan); and receive public comments and concerns.” That is, at least on paper, very little power. But clearly some people believe that if enough people consistently show up to the COAB’s public meetings and actively engage the board they can have an effect that goes beyond the COAB’s mandate. Imarisha did not disagree, urging a multiplicity of strategies. There are many roads to a more just world, and that world looks a little different to everyone. Fittingly, people at the vigil were asked to describe their ideas of justice and a more just world in one sentence or phrase. The answers, while all pointing to the same end, were hardly the same. Truth, renunciation, and reparations. Love and trust in each other. Social responsibility to everyone. Trust and respect. A society that meets everyone’s needs. Everyone being able to realize their potential. Shared Power. Community control of their housing, jobs, and schools. In his song “I Guess I Planted” Woody Guthrie wrote a lyric about how his “lonesome seed of a song” that was “such a little song” compared with the more famous ones was one of many such songs that eventually led to the “big ones” that made great gains–in that case toward greater justice for workers. Seemingly small actions, such as the one that occurs on the twelfth of every month, is one of those many seeds being planted across the country, albeit often ignored by the sources of power they subvert.